CEL (www.cel.com) today announced the availability of CEL CG2409 family of high power RF switches. RF switches are microwave devices that route high frequency signals through transmission paths and can be used for diverse range of applications including WLAN, Mobile Communications, Wireless Security, Wireless Home Automation, Digital TV and many other RF products. The CG2409 is available in two packages X3 and M2. The CG2409X3 and CG2409M2 are manufactured using state of the art pHEMT technology and are packaged and tested in Japan to guarantee high quality and reliability. These RF switch components can be used within an application to switch between Transmit / Receive modes, as Diversity Switches, switching between two different antennas, and also switching between RF Frequency Bands. The CG2409X3 is a wideband, high-power single-pole, double-throw (SPDT) GaAs MMIC RF switch, specified for the frequency range of 0.05 to 6GHz, and can operate at a control voltage from 1.8V to 5V. The P0.1dB compression point of the switch is 37.5dBm at 3V. The second and third harmonic specs are -80dBc and -85dBc respectively at input power of 26dBm. The insertion loss ranges from 0.3dB to 0.6dB while the isolation ranges from 32dB to 28dB over the frequency range. The device is in a compact 6-pin XSON package (1.5mmx1.5mmx0.37mm). The CG2409M2 is also a high-power single-pole, double-throw (SPDT) GaAs MMIC RF switch but is specified for the frequency range of 0.05 to 3.8 GHz and operates at a control voltage from 1.8V to 5V. The P0.1dB compression point of the switch is 36.5dBm. The second and third harmonic specs are -80dBc and -85dBc respectively at input power of 26dBm. The insertion loss ranges from 0.35dB to 0.6dB while the isolation ranges from 35dB to 21dB over the frequency range. This device is in a small 6-pin surface mount package (2.0mmx1.25mmx0.9mm). Why use a High Power SPDT RF Switch? There are two trends that dominate recent Wi-Fi systems development. One is the increase of RF transmission power for improved coverage range and better signal quality, and the other is the increasing use complex modulation schemes to boost the data throughput. Both trends put more stringent requirements on power handling capability as well as linearity of the RF components used in the transmission path in order to meet regulatory and signal integrity specifications. As a result, these RF switches at the antenna ports are now one of the most critical components. While more integrated front-end-modules (FEM) are finding increasing usage, particularly for space constrained applications, discrete MMIC switches still offer the most flexibility in terms of system configuration and performance selection. 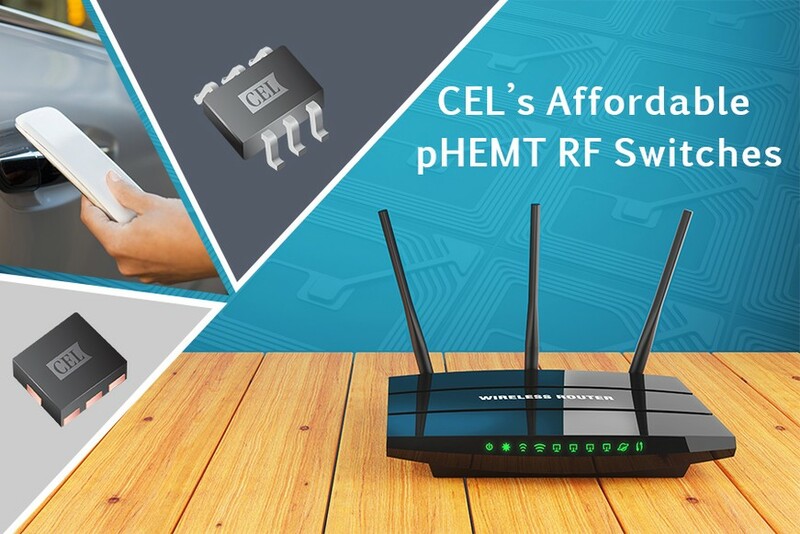 CEL offers a broad selection of wireless and networking components including RF/microwave transistors and ICs, optical-coupler ICs, laser diodes, photo diodes and high-speed interface ICs. CEL also designs and produces Cortet™ and MeshConnect® wireless solutions and platforms for IoT applications. CEL is the exclusive gateway into the Americas for RF and Optical Semiconductors from Renesas Electronics (formerly NEC Electronics). We also build on our more than fifty years of wireless excellence to offer our own wireless components and solutions in addition to those from Renesas. Our team of highly skilled Applications Engineers supports diverse designs using components from all product lines. CEL has technical centers in Santa Clara, California (Silicon Valley), Buffalo Grove, Illinois (Chicago area) and Lafayette, Colorado (Boulder/Denver area). CEL supports customers through direct sales offices, sales representatives and distributors worldwide, with offices in Hong Kong and Tokyo that support the Asia Pacific region.